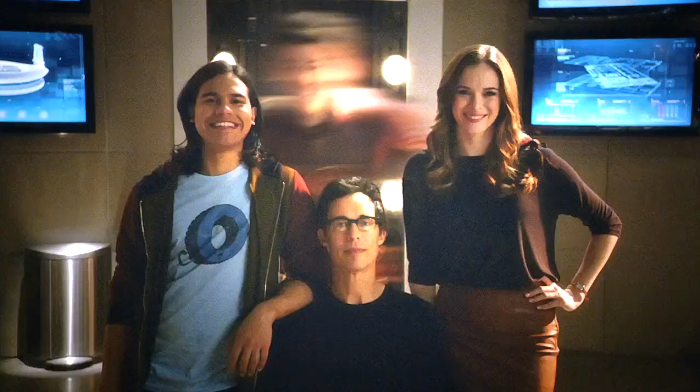 The Flash activates a two-second self timer on his phone, drops it, rejoins his group in a flash to pose for the photo, and then quickly returns to catch the phone. We’ll start by noting one simplifying factor: His phone is using a LED for lighting. We can and will assume its light is constant. We don’t know his camera settings, but let’s assume an exposure time of 1/100 s. And that the phone is five meters away from the group. A view from the opposite side. 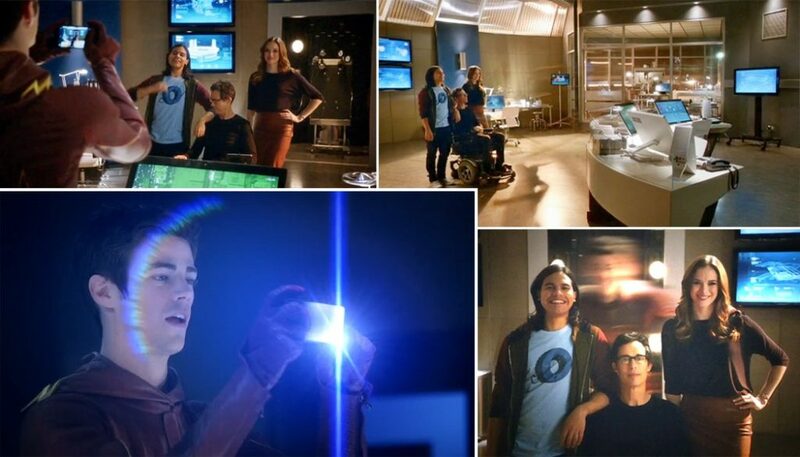 The Flash’s original position on the right is empty; the phone, with its LED shining, is hanging in the air. The Flash is moving leftwards (see the shadow on the ground). What Actually Happened? And Could It Have Happened? How can a camera capture something that isn’t in the viewfinder? Don’t forget that light is falling on a camera’s chip throughout an exposure. The ratio of the time that an object is and isn’t in a spot during a shot determines how much the object will be mixed with that spot’s background. But with an exposure time of 1/100 of a second, this could still be 2/1000 of a second for the background and 8/1000 for our hero (totaling 10/1000, that is, 1/100, of a second). Why didn’t they use a selfie stick? You might ask—why didn’t the heroes use the selfie sticks that are so popular today? The answer is: in 2014, when this series was running, selfie sticks weren’t as popular yet. ‑But selfie mania was already underway. Which is probably why this scene made it into the show. Shot in progress. Our hero has returned to the group (and the camera has registered him for a moment as a blur). Won’t the falling camera blur the entire photo? It depends on how long the exposure is (and thus how long the camera’s falling). The exposure time is 1/100 s, and the falling-distance formula is: distance = (gravitational acceleration×time2)/2. So in our case: 0.495 mm. Depending on the camera’s center of gravity, it might also have rotated a little. So the drop may have blurred the picture. But in light of the low quality of phone cameras, I wouldn’t call that blurring noticeable. 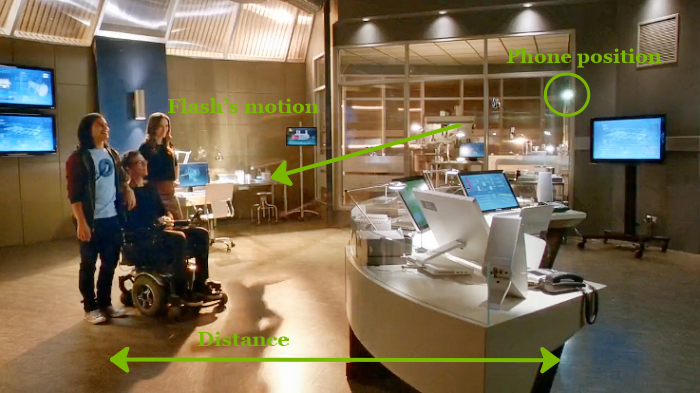 Since we’re geeking out already: The Flash would have to be moving here at over 1000 meters/second. That’s roughly Mach 3—that is, three times the speed of sound (near the ground, in a normal atmosphere). That, of course, means there will be a sonic boom. The same sound that accompanies supersonic jet planes and flashes of lightning. Not good news for picture sharpness… or for his friends’ expressions. But its strength does depend on the mass of the object in motion, so this really may be minor after all. The Flash Flashing with a Flash. In a Flash. 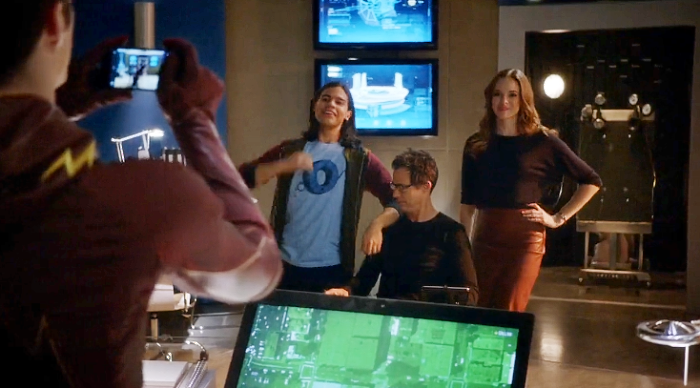 Let’s imagine for a moment that The Flash is holding a pro-class DSLR and shooting with a flash. Will the shot work? Yes—in some cases. Normally a flash synchronizes “to the front curtain,” that is, to the start of an exposure. So there is a very short period between the trigger press and the start of the exposure. This period is called shutter lag. It ranges from a few dozen to a few hundred milliseconds. For example, a professional Canon 1D X has a mere 36 thousandths of a second of shutter lag. So for our Flash to be captured in the photo, he would have to run five meters in 0.036 seconds (about 139 m/s). However, by the calculation above, that’s not a problem. If there were no such thing as shutter lag, or if it were very short, then our hero might still be saved by “rear-curtain synchronization,” where the flash isn’t fired until the end of the exposure. Unfortunately, there are no superheroes running around us (or if they are, they’re too fast to see and too smart to tell us), so all of the above problems are just theoretical. But there’s no harm in brushing up on the laws of physics once in a while, and learning a bit about our cameras in the process! If the bit about flash firing caught your interest, you might want to also check out Vit Kovalcik’s overview of work with flashes. And how about you? Have you bought a selfie stick yet? Are you just not the selfie sort? Or are you planning to use your super-speed? 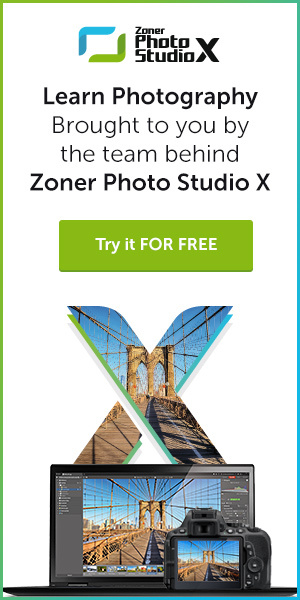 I’ve been forging marketing plans for Zoner Photo Studio since 2013. In my photography I concentrate on portraiture, but I also like to experiment. 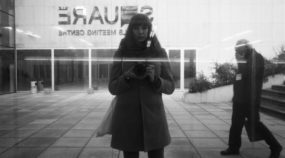 You can find my work on Zonerama.